Positive Media Camp – sign-up extended! 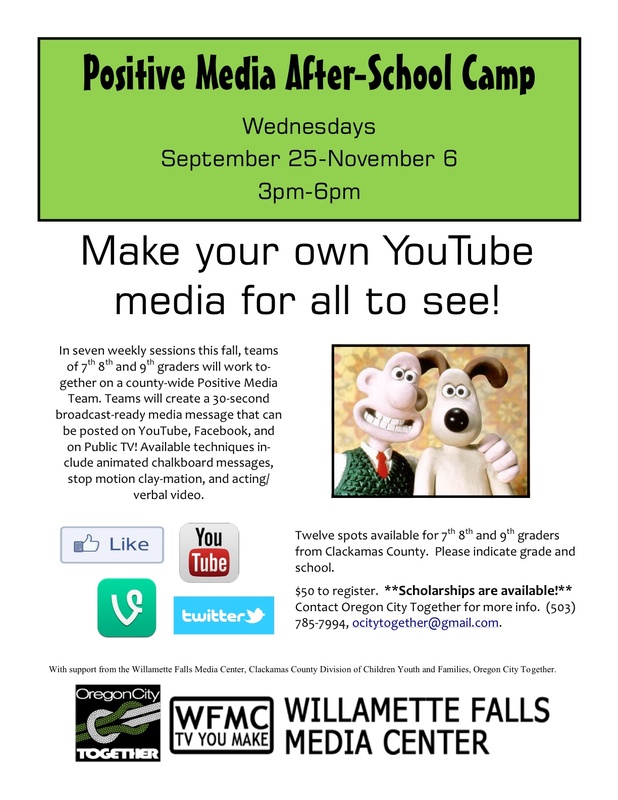 In seven weekly sessions this fall, teams of 7th 8th and 9th graders will work together on a county-wide Positive Media Team. Teams will create a 30-second broadcast- ready media message that can be posted on YouTube, Facebook, and on Public TV! Twelve spots available for 7th 8th and 9th graders from Clackamas County. $50 to register. *Sign up by phone only after September 25th, 503-785-7994 or 503-785-7993. Scholarships are available! Contact Oregon City Together for more info. ocitytogether@gmail.com. Follow this link for registration details. http://www.octogether.org/wp-content/uploads/2015/03/logo-banner.png 0 0 OC Together http://www.octogether.org/wp-content/uploads/2015/03/logo-banner.png OC Together2013-08-27 15:33:412013-08-27 15:33:41Positive Media Camp - sign-up extended!